Are there natural anxiety treatments? The answer is: YES! There is help! There are many ways to treat anxiety naturally. Below, you will find selected acu-points, which I have found to work well, in reducing anxiety. 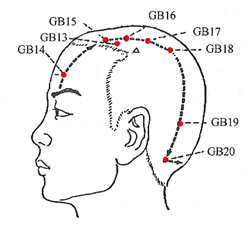 In the body meridian theory, anxiety is an imbalance in Qi flow, mainly in the heart meridian. The spleen meridian compliments the heart meridian. Anxiety is sometimes a reflection of excessive worry, holding energy in the spleen and causing deficiency in the heart meridian. PC7 - Calms the spirit. Used for mania, hysteria, insomnia, panic, fear, sadness and weariness. PC6 - Calms the spirit. Used for palpitations, anxiety and shock. Good for nausea. 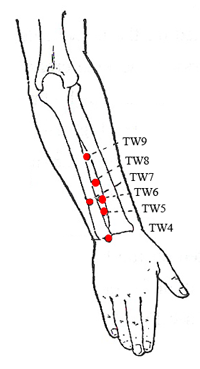 TW5 - Regulates Qi flow through the meridian; can be used for excess fear. 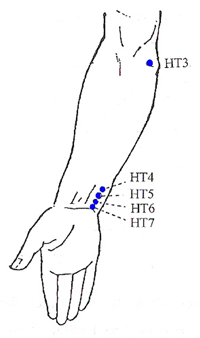 HT7 - Used for anxiety, palpitations, fear, sighing, forgetfulness, mania and depression. HT5 - Used for palpitations associated with fear, heart pounding, headache, anxiety and fear with people. LU1 - This point opens the chest and allows deeper breathing. It helps to balance and release stored emotions. 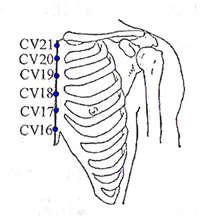 CV17 - Used for calming and centering, nervousness, anxiety and depression. 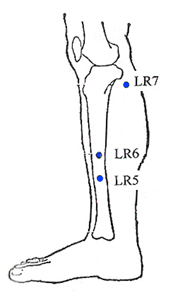 In oriental medicine, depression and anger are both imbalaces in the liver and gallbladder meridians. Depression ... or Blues... is often seen as the opposite side of anger - anger turned against itself. Maybe you feel your life has no purpose, or you've lost connection to your heart. Take some time to connect with yourself... using the following acupoints. 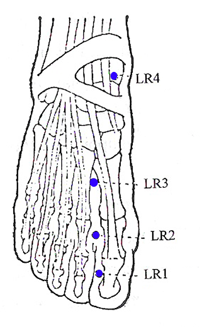 LR3 - The liver meridian Source Point, which assists the smooth flow of Qi throughout the body. Provides an overall calming effect. LR5 - Eases depression, fear and palpitations. GB20 - Relieves irritability and clears the mind. 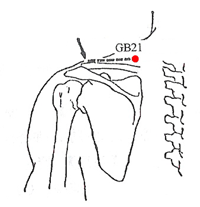 GB21 - Relieves frustration, irritability and fatigue. 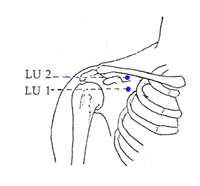 LU1 - This point opens the chest and allows deeper breathing. It balances and releases stored emotions. 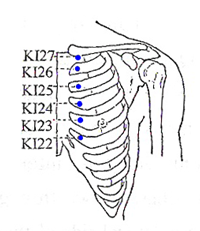 KI27 - Used for headaches due to mental strain, mental fatigue, disorientation, anxiey, palpitations and irritability. CV14 and CV17 - Used for calming and centering, nervousness, anxiety, depression and fear.